Your tooth is composed of two essential components. We’re all familiar with the white crown that makes up your smile, which is the part that most reconstructive services rebuild following tooth loss. However, there’s also something important hidden beneath the gum line – the root. Without a functioning tooth root in place, the jawbone loses vital stimulation and can begin to deteriorate. This is why so many older people start to develop a “hunched” appearance in the face after years of sustained tooth loss. At Boyles General Dentistry & Implant Center, we want to introduce you to a truly revolutionary service that will faithfully recreate every part of your missing tooth with outstanding seamlessness – dental implants. Dr. Stephen Boyles has undergone advanced training in implantology, and he will be able to carry out every step of treatment right here in Midland for optimal success. Please contact us today if are struggling with tooth loss and would like to explore your options. Once we’ve completed a consultation and confirmed that dental implants are the right choice for the patient’s circumstances, the first major step of the treatment is the surgical placement of the implant(s) into the jawbone. By doing this, the implant will effectively take the place of the root, stimulating the tissue and creating a strong foundation. Dr. Boyles will personally perform this procedure, using modern technology, including surgically guided placement when needed, to ensure the most precise and successful results possible. After the implant or implants are seated in place, the patient will need to undergo a period of healing. During this time, the natural tissue bonds with the biocompatible implant, setting the stage for the final piece of the puzzle: the new, custom-made restoration. 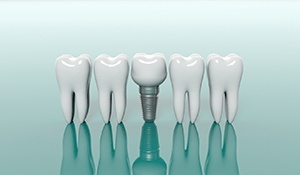 There are several options available in today’s world for restoring placed dental implants. Our recommendation will depend on the patient’s personal preference, available budget, and the extent of their tooth loss. 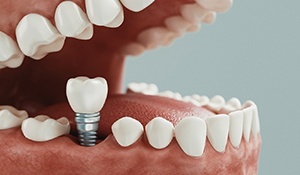 If only one implant/tooth needs to be rebuild, a customized, all-porcelain dental crown is ideal because it will not negatively interfere with nearby healthy teeth. If a patient’s tooth loss is more significant than the above examples, implant-retained prosthetics can be used to replicate an entire arch of the smile all at once. 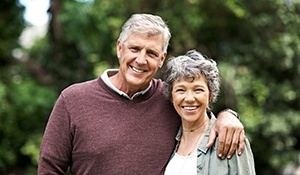 Instead of staying in place through natural suction and/or connections to nearby teeth, the customized denture is anchored to a small number of implants that have been placed in strategic positions. The result is cost-effective, high in quality, and wonderfully lifelike. There are two major types of implant-retained dentures. If the patient wants their new prosthetic to be as identical to natural teeth as possible, a hybrid denture is the right choice. Our dentists will fix the denture in place permanently so that it can only be removed by us for regular maintenance. Alternatively, patients who have used traditional dentures for many years may not want to give up their prosthetic’s removable nature. In this case, we recommend overdentures, which reap the benefits of implants while still maintaining those comforting, traditional qualities.